Not only do garnets have many colours; they also have many names: almandine, andradite, demantoid, grossularite, hessonite, pyrope, rhodolite, tsavorite, spessartine, and uvarovite, to quote but a few. But let us restrict ourselves to the most important and begin with the red garnets. First, there is the fiery red pyrope. 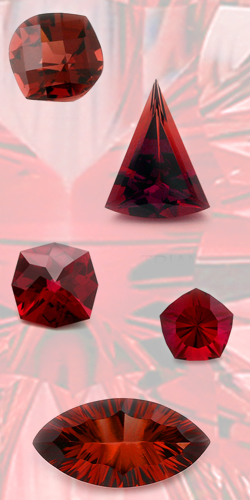 Its spirited red, often with a slight brownish nuance, was a gemstone colour much in demand in the 18th and 19th centuries. Garnets from a find in the north-eastern part of the former kingdom of Bohemia - small stones of a wonderful hue - were world-famous at that time. In Europe, they were worked into jewellery a good deal, especially in the Victorian period. That genuine Bohemian garnet jewellery was traditionally set with a large number of small stones, which were close to one another like the seeds of a pomegranate, with their red sparkle. And today too, garnets are still found in former Czechoslovakia and set close together according to the old tradition, the attractiveness of classical garnet jewellery thus consisting mainly in the beauty of the gemstones.